The Caribbean Crawl is back for 2019!!! On Saturday May 18th we bring the Islands to the District for 8 hours of Live Music, DJs, Hand Drummers, and of course.. Alcohol!!!! Hundreds and hundreds of Caribbean Music lovers will head to U street for an all day party involving 6 amazing bars from 3 – 11pm!! All of the bars are walking distance from each other and will feature either a DJ or band playing International sound from the Caribbean and beyond!! For The Bar Crawl First Timers…. 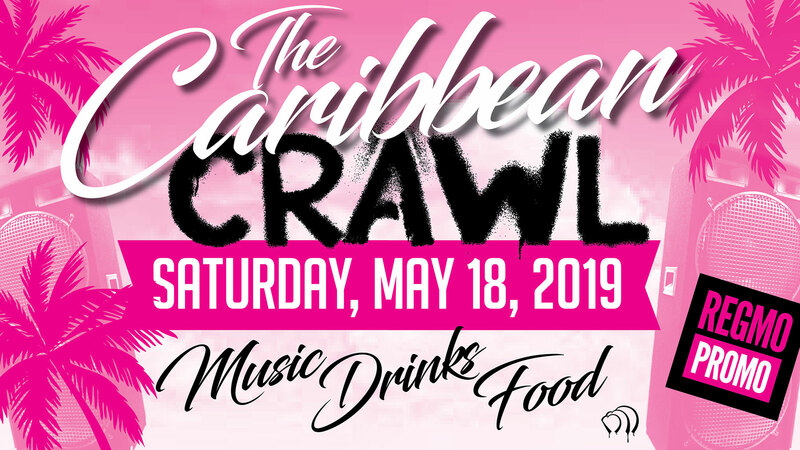 The difference between the Caribbean Crawl and a normal bar crawl is that there will be different international music themes, multiple djs, live music, and discounted drinks at each one of the bars. The crawl involves 6 bars with a different DJ or Live Band at each one. DJs spin a different theme at each bar but it’s all Caribbean and International sound!! Reggae Dancehall, Soca, Hatian, AfroBeat to name a few. Every bar also will feature exclusive drink specials for bar crawlers. Each bar will be on a schedule and open for a 3 hour block between 3 and 11pm. (The most fun is to hit up all of the spots so pay attention to the schedule). You must purchase a ticket in order to join the crawl. TICKETS WILL SELL OUT, so advanced ticket purchase is highly recommended to guarantee your spot on the crawl. Attendees can check in at any of the bars involved during their 3 hour window. They will be given a Caribbean Crawl wristband that will allow entrance to the venues participating. Bar crawl swag will be given out at the first bar to advance ticket purchasers while they last. Only a limited amount of wristbands will be available on the day of the crawl for $30(cash only) at 3pm at Vivid Lounge (1334 U St.). YOU MUST HAVE A WRISTBAND TO PARTICIPATE IN THE BAR CRAWL. Any questions or concerns, please email Monisa at Monisa@regmopromo.com. More information and updates to come. Grab some tickets and jump on the crawl!! U Street Cardoza Metro and Metrobus stops are along the bar crawl route. Lyft, Uber, Via, and Cabs are all around. Release From Liability. Attending “THE CARIBBEAN CRAWL” releases any and all claims, causes of action, or demands against RegMoPromo Holdings, Inc, its successors, assigns, officers, agents, representatives, employees and crawl organizers (collectively or individually, “Releasees”) for any personal injury, death, property damage, or loss sustained by me as a result of participation in a crawl offered by Releasees due to any cause whatsoever, including without limitation, negligence on the part of Releases or other participants. Cover Notes: Advanced Discount Tickets available on Eventbrite. Limited $30 Tickets available the day of event.